I was reclining on the beach at Ölüdeniz (Dead Sea), a seaside town on the Mediterranean coast of Turkey. This vacation had been one of our best. It was a perfect day and I was engaging in my favorite vacation activity, hanging out on the beach and soaking up the sun. Out of the corner of my eye, I noticed bright splashes of color descending through the air from the mountain range above us. As the objects came closer, I saw people hanging from fascinating canopies, doing graceful wing-overs and daring spiral dives, six thousand feet down to the beach. I looked towards my husband, an aviation enthusiast, and I knew he was paying attention. I imagined the wheels spinning inside his head. We had to find out what these people were doing. Mike and I visited the paragliding shops on the beach and began learning about these colorful aircraft. The local pilots explained to us that paragliders are kind of like hang-gliders in backpacks. Of course, we had to try it. We each signed up for a tandem flight. After surviving the harrowing hour-long drive to the top of Babadag (Father Mountain), we knew we would not back out. There was no way we were going to take that truck ride back down the steep mountain road. We tried it. Our tandem flights were awesome. We saw the coastline like we had never seen it from the ground. We were soaring. After gently landing on the beach, our knees weak and the adrenaline pumping, we went for a beer. I asked Mike if he'd like to do it again. Mike said, "Yes, I want to do it again but next time, I want to be the pilot!" We were hooked. When we returned to the Bay Area, we located a paragliding school and signed up for lessons. I began to whittle away at my fear of flying and my fear of heights (not to mention my aversion to excessive physical activity) and before long we received our official paragliding ratings. What we didn't realize then was that our training was only beginning. We had a license to learn. As we became more experienced pilots we discovered that the more we learned, the more we had to know. We just couldn't seem to get enough! Every weekend, weather permitting, we pack up our wings and head for the hills. The sport has renewed our interest in hiking and camping and has resulted in our becoming physically fit. We have gained an education about weather patterns and are much more in touch with nature and the environment. We are learning how to understand the sky, listen to the trees, read the waves on the water and follow the birds as they soar above us. We are always searching for new places to fly. Everywhere we go, we find a family of local pilots who are genuinely happy to share their local sites and experiences with us. We have gained a wealth of new friends. The gliding community is diverse, congenial and fun. Our vacations will never be the same. Our lives will never be the same. 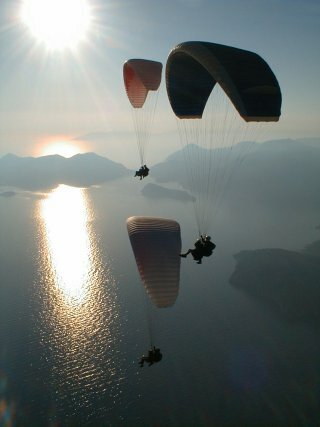 Three years after our first paragliding flight, we returned to Ölüdeniz to fly from the top of Babadag. This place has become a Mecca for paraglider pilots. Each year, seven thousand tourists take tandem flights and one thousand solo pilots come to fly. Despite the numbers, there is plenty of air for everyone from this magical mountain. We immediately located the tandem company who was responsible for getting us interested in this crazy sport. We were happy to see that they were still flying high and they were more than happy to make sure that we had a positive flying experience at Babadag. Their entire team was absolutely terrific. The owner of the business made sure that we had a ride up the mountain every time we wanted to fly. We got a good site introduction and plenty of on going support from the tandem pilots and drivers. After every flight we were greeted with a smile by the "professionals" who folded and re-packed our wings. We were treated like family and were sad to leave our good friends when our vacation ended. We will never forget the experience of flying at Babadag. Our only consolation is knowing that we will return to fly again each summer. Paragliding is relaxing and exhilarating and it provides an all-important respite from putting out fires at the office and mundane domestic chores. The sense of achievement and accomplishment I've gained has contributed to an increased confidence that has had a positive influence on my professional and personal life. The rush I get from flying on weekends keeps me going during (most of) the workweek. I'm frequently daydreaming about my last flight or anticipating my next one. I've got a passion for paragliding. It has filled a void in my life that I didn't even know existed. I can barely contain my enthusiasm for the sport. Paragliding may not be for everyone, but everyone should discover his or her passion and go for it!